One day I asked my very 2-year-old daughter what she'd like to have for a snack. She looked at me with an impish grin on her face and said, "Butterflies!" Just as I was about to say no, I got this idea and thought it might just give the old "Ants On A Log" recipe a run for its money (Ants On A Log consists of celery stalks filled with peanut butter, and topped off with raisins to resemble "ants"). It was a success, and is simple, healthy, and fun to make! Break breadsticks into two or three pieces depending on size. 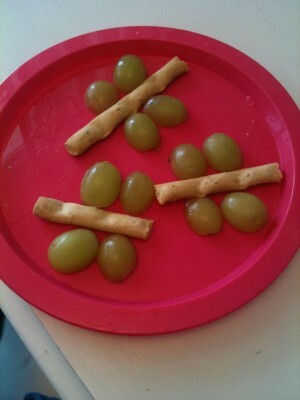 Arrange the grape halves on each side of the breadstick pieces, in shape of wings (two near the top of each side, and two near the bottom).